High school social studies teacher Peter Paccone shares how his students have “stepped up”, and why he is pointing them to the KQED Youth Media Challenge. This fall, KQED launched a Youth Media Challenge. The topic? Something I’ve been passionate about and have encouraged my students to be passionate about, as well: Stepping Up. It’s a message I deliver often in my classroom: Step up. Get behind something that you’re passionate about. Seek to make a difference. It doesn’t matter whether you seek to improve the school, the city, the state, country, or the planet. Just try to bring about some kind of change for the better and then, at the end of the term, be prepared to share what you did and how you did it. That’s what I tell my students. Many of my students have responded to my challenge in remarkable and noteworthy ways. I know there are students everywhere taking actions big and small to effect change. And so many of those inspiring stories are just waiting to be shared and used as sparks to motivate others to action. That’s why I’ll be sharing KQED’s Youth Media Challenge about Stepping Up with my students, asking them to share in a video, audio, or written piece, an issue or event that sparked them to act, and what they are doing about it. This semester, Jinze Wu gave an outstanding, ten-minute, college professor-like Google Slideshow presentation to the students enrolled in my first period Honors US History class. 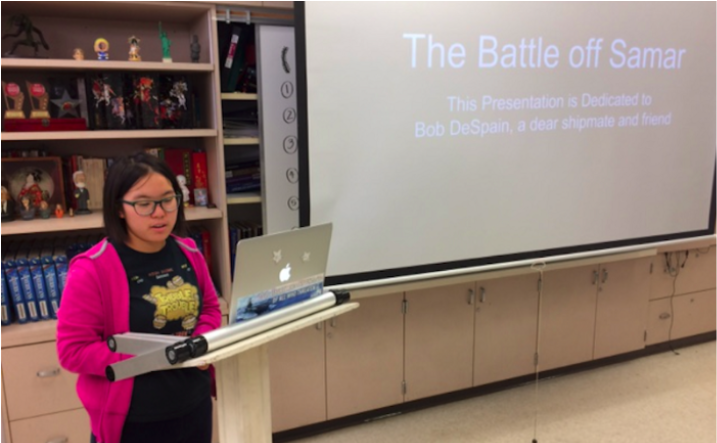 SMHS junior Jinze Wu at the start of her Google Slideshow presentation. Jinze’s presentation was entitled The Battle off Samar and it was dedicated to Bob DeSpain, a survivor of the World War II Battle off Samar. This battle was the centermost action of the Battle of Leyte Gulf—one of the largest naval battles in history&mdash’and it took place in the Philippine Sea off Samar Island in the Philippines on October 25, 1944. Jinze got to know Bob over the course of the past two years while she was volunteering aboard the Battleship USS Iowa (berthed in San Pedro). Bob DeSpain spent several days in the water after his ship, the USS Hoel, was sunk by Japanese forces during the battle. Bob, who also served as a volunteer aboard the Iowa, recently passed away at age 93. Jinze came to view Bob as a dear shipmate and friend. Jinze’s passion for World War II naval history was sparked in 7th grade when watching World War II movies with her father. That led her to read more about the history, and visit various historical ships. She chose to volunteer twice a month aboard the USS Iowa to help preserve and educate others on its significance. The best part of this story—Jinze didn’t do this for a grade or any kind of extra credit, or in response to an assignment. She felt so passionately about sharing Bob’s legacy and service, she stepped up on her own accord to tell the story. I’m inspired by Jinze’s stepping up to volunteer with the Battleship USS Iowa, and then to share the knowledge and history she’s learned along the way with others, in honor of her friend and shipmate Bob. I think others would be, too. So I’m encouraging Jinze Wu to visit the Youth Media Challenge webpage and apply for both a chance to have her unique story published on KQED’s website, AND for it to be screened at a KQED-hosted media festival in January. I’ll bet you, my fellow educators, know a student—or two, or twenty—that have some great “stepping up” stories of their own. And if you’re looking to provide inspiration to students searching for a way to step up, check out this handy doc I created. Here is the KQED Stepping Up Video Series, Classroom Guide, and Student Viewing Handout to support KQED’s Youth Media Challenge. And click here to learn about KQED’s Stepping Up Online Screening featuring the stories of youth activist and what inspires them to change. This screening is happening on Monday, November 6 (4:00-5:00 PM PST).